I have been meaning to get out and photograph this house for a number of years. We finally got around to it this summer of 2018. Sharon and I got in the car and made the drive, around 75 minutes by car, from Windsor. It is located on the Talbot Trail between Palmyra and Clearville. Seeing it in person is much different than many of the photos that turn up in a Google search. The wrap-around porch was removed in recent years and the exterior trim has either been removed or fallen away. Decay at the mercy of mother nature over the years. The Guyitt Homestead is still worthy of a visit if you dig Canadian nostalgia and romanticism. Here are a few shots for your viewing pleasure.. Click on any photo for a larger, more detailed view. As always prints are available on request. I welcome you to use my Contact Page if you have questions, comments or would like to buy a print. 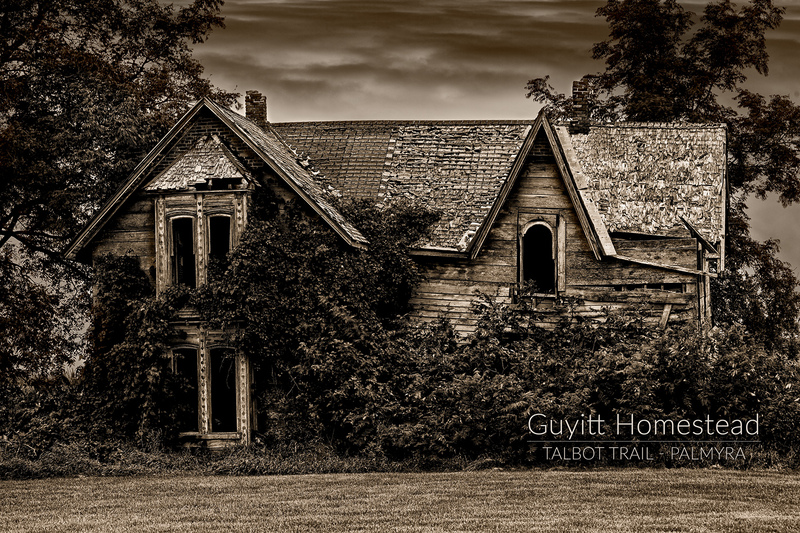 This entry was posted in Architecture, Exploration, Photography, Travel and tagged abandoned, exploration, explore, house, ontario, photography, talbot trail.